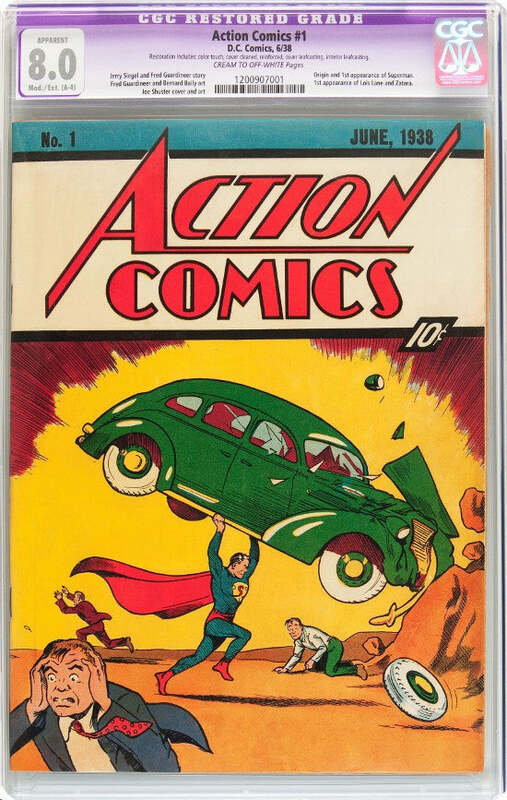 A restored copy of Action Comics #1 sold for $163,000 at Heritage Auctions' Comics and Comic Art Signature Auction in Dallas on August 7-9. Heritage stated prior to the sale: "An unrestored copy in this grade [8.0] would sell for a million dollars or more, so the prospect of paying just a fraction of that for an appealing professionally restored copy such as this one is enticing indeed." A 9.0-graded example is the world's most valuable comic book after it sold for $2.1m at ComicConnect in 2011 - although a slightly better 9.0-graded copy that is selling on eBay looks likely to break that record. A three-page original story by legendary counter-culture cartoonist Robert Crumb sold for $131,450. Titled Ducks Yas Yas, it's described in the title square as "a story about big city blues, about the stoned out gurus, hopped-up saints and flunked out hipsters who roam the streets and stay up all night and don't watch television!" It was created in 1968 for Zap Comix, his first publication, back when he was a relative unknown with his work only appearing sporadically in the Village Voice. Heritage commented: "Finding any published R. Crumb comic book original art from this period is remarkable, but getting the chance to bid on a complete story like this is practically unheard of." Why not check out our range of books and manuscripts? Please sign up to our free newsletter to receive exciting news about books and manuscripts auctions.